What happens when a visitor arrives at your site? Do you have a pathway set up to guide them from that first visit through dozens of points of contact until they become a customer? If this isn’t all set up in advance – Web, blog, social, email, and online store – there’s little point in getting traffic to your site. 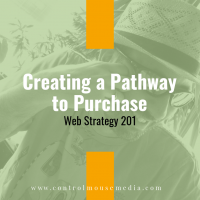 Let’s take a look at how to set up a pathway to purchase for your business. We are obsessed with getting traffic to our websites. I want to challenge that concept, because let’s face it – random traffic doesn’t do that much for you. 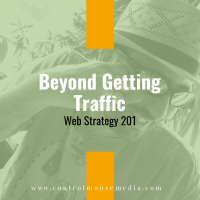 Web Strategy 201 is getting beyond just “traffic” as a goal and making your site much more active in the sales process. Competition on the Web is tough. You can’t just hang your shingle and expect people to show up. A basic website isn’t good enough anymore – it needs to function as a PATHWAY for prospective customers. 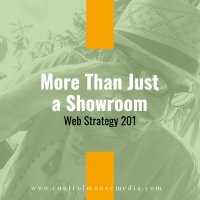 Here’s how to make your website carry more of the sales load for you. Have you noticed that some of the basic strategies behind your website, blog, social, and email marketing have started to lose some of their effect? That’s because content marketing is now mainstream, with everyone relying on the same set of tactics. 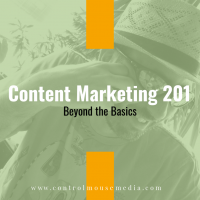 Time to level up with Content Marketing 201. A solid marketing plan has three stages, depending on the growth cycle of the business. In the season finale of Marketing Without the Marketing, I take a look back at the past year and how this has influenced my most recent projects. The new season kicks off with a reset to zero! Let’s look at how creativity and business go together, and how you can rethink your own approach to your current project, job, or business. The challenges you face in starting a business are different than any other thing you’ll do in your career. 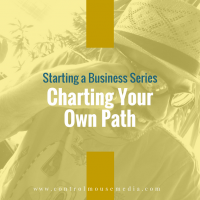 Episode 131 is a summary of my 10-part series about the early days of my small business – my strategies, successes, and mistakes – so that you have somewhat of a roadmap in your own journey. Email is your conversion instrument. It’s 40 times more effective than social media in this regard, so building your email list is one of the most important things you can do for your business. It pays to get started early, with a plan for segmentation and some simple automation as well.